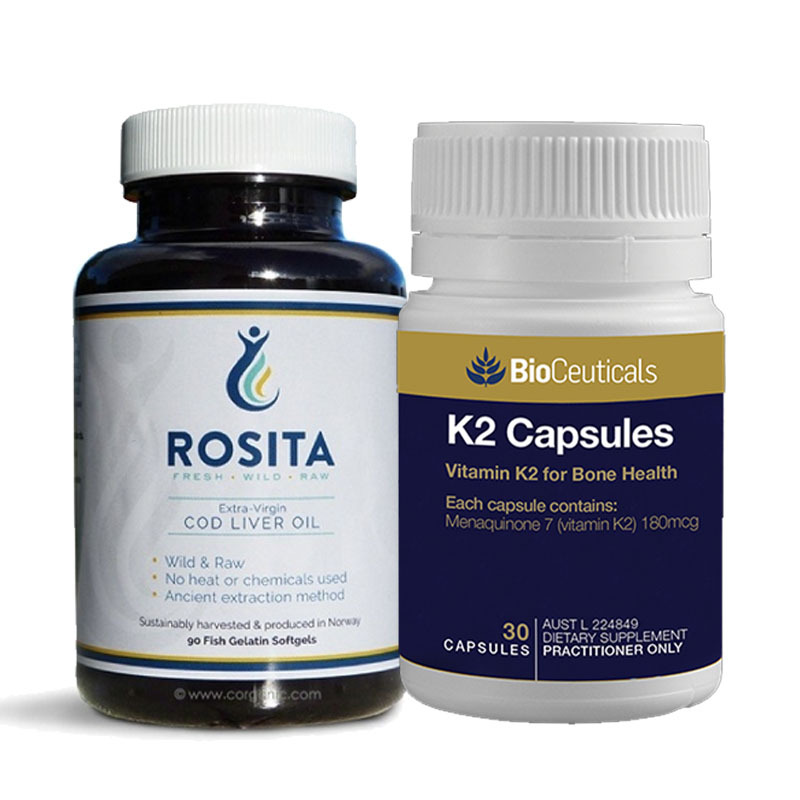 The fat-soluble vitamins A, D, and K work together so this duo of Rosita Cod Liver Gelcaps and K2 is an ideal combination. 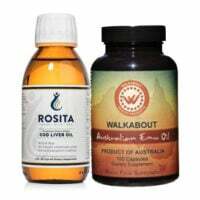 You can get the liquid Oil and K2 caps here or with Emu Oil providing the all-natural K2 here. Rosita Cod Oil is fresh and raw, made in Norway the way the Vikings did, draining the oil from fish pulled right from the water. It contains natural A and D (not added back as all other Cod Oil does) and replaces “regular” processed fish oil. It contains more DHA than EPA, a ratio only true cold water Atlantic cod can provide. Read more about this superior oil here and here. BioCeuticals MK-7 Vitamin K2 has the longest half-life in the body compared to other forms of Vitamin K2. Always, always take K2 when you take Vitamin D. It gets calcium where you want it to go and keeps it out of your arteries, gall bladder and kidneys (stones!). Here is one article and a podcast on the merits of K2 daily for life. If you have issues completing your order, please Contact us. You don’t need a PayPal account to use a credit card. 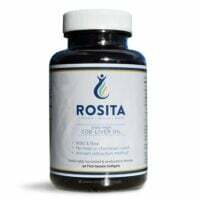 3 Rosita cod liver oil caps provides 1/3 tsp. of Cod Oil. Store at room temperature; do not refrigerate. Take with food with fat. 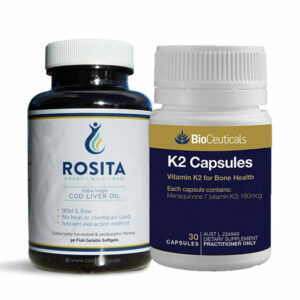 Always take Vitamin D (such as Cod Oil has) with Vitamin K2 such as our Emu Oil or BioCeuticals K2. High Vitamin Butter oil is an inadequate source of K2. Extra D3 like this one may be helpful too. Contains 90 capsules (500 mg each). For more information, please read this blog post or listen to my interview with co-founder Archie Welch. BioCeuticals Vitamin K2 (MK7) Suggested Use: 1 capsule daily w. food, preferably forever. Kids too. Ingredients: Amount Per Serving Vitamin K2 (as menaquinone-7) 180 mcg, a higher dose than most products but safe for all. Contains 30 caps. Other Ingredients:Rice bran oil, softgel shell (gelatin, glycerol, iron oxide color, purified water), medium chain triglycerides. 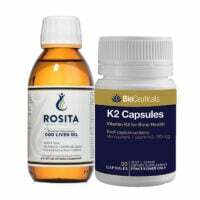 Read more about BioCeuticals Vitamin K2 here.